Martha Decker is the founder and owner of East Texas Paranormal. She has been interested in the paranormal since childhood when Decker began having unexplained personal experiences. After being involved in paranormal investigations since 1999 Decker made the decision to get serious about the paranormal or unexplained and decided to form a group. When Decker retired from law enforcement in 2007 she thought the timing was perfect and the group was formed. ETX Paranormal is sometimes open for bringing in new members, especially those with experience. ETX Paranormal is located on Cedar Creek Lake and about 60 miles SE of Dallas, TX. 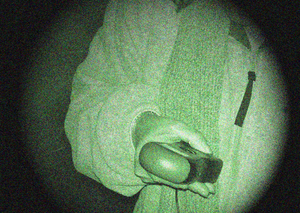 ETX Paranormal is dedicated to investigating locations that may have paranormal or unexplained activity. They may even conduct an investigation into a location with no prior history of activity. They are ready to go when it comes to a home or business owner in need of help. Our mission is to help those in need of a paranormal investigation or who may just have a few questions. There is never fee for an investigation. Please be sure to contact ETX Paranormal with any questions. Have an item you don’t want in your house that makes you feel uncomfortable? Let us know and maybe we can help. Something else Decker did was join the American Ghost Society. She is a Texas area rep for AGS. ETX Paranormal will be glad to conduct whatever investigation is necessary. We are also proud to be a part of the Paranormal Warriors of Saint Michael (PWSM) Network. We never charge a fee and if we can’t help you, we can find someone we know in your area of the country who can help. I live in the huntsville area and id like to talk to you about a cemetary in dodge tx..i really believe it would be a good place to investigate..my grandfather is buried there and i took some pictures there that showed some strange things..i had to reset my phone and lost the pics but i showed them to all my friends and they can back me up.there are graves there from the 1800s..my pics showed strange people dressed in old clothes…skulls..and some kind of animal..i never seen these things till after i got home and went thru the pics.i wouldnt waste your time..i really think there is something going on there. Darrell, pls use our contact form so we can get in touch with you. The sketch is tasteful, your auhored subject matter stylish. Hello Martha, and EXT P, I was wondering if you give the opportunity to join in on an investigation. While I do have experience, I would like to have the chance to observe the way you and your team handle this process. I look forward to hearing from you. My Edgewood friend, Bob Massey, and I met our GHOST one dark night in 1958. The account is published in my short story collection, Once Upon A TIME… IS TEMPERATURE! entitled “A True Ghost Story.” The book is availble in the book stores–or I can lend you a copy. Buz Craft, P.O. Box 565, Wills Point, Texas 75169, 903-873-2367. Hello Lauren, Stay tuned as we have a Meet & Greet set of May. We will post the information soon. scott greunwald recommended you to me. thx for taken a second to rrspond! Hello, you can reach us by sending an email to etxparanornal@gmail.com. Thanks for your interest. How do you know Scott? I am a member of a social club in my town. Your blog has gave me some awesome information to talk about in our next meeting. You have done a awesome work! Hi Arthur, send us an email and we will see what we can do. Include contact info, where you live, experience, etc. The contact info is on our About Me page. Hi, here is our email – etxparanormal@gmal.com. I grew up in Northern MN in a hauted house from age 6 until 2 weeks after H.S graduation at 18 when I was finally able to flee. Too much stuff happened to recount it all here…everything from me seeing them on & off over the years, Daily continual contact they made with us as well as trying out every new gadget we got from the microwave at all hours to playing pool on the new table. My parents sold the house & moved state shortly after I left w/o informing the purchasers of Our experiences. I have since found out that those 1st people left the house in just 2 years. Many times over the last 20yrs I have drove by my house and longed to step back inside to see if “they” are still there. Just this month I was back in town and the drive by. Always before the feelings were Not there as I looked at the how the house & yard had changed, this time was that eerie feeling. My question is: Would it be proper for me to knock on the door, ask to look around and tell the owners what I know? One half of me misses being around my oldest & closest friends even tho the entire time I lived there was filled with fear, anger and deep depression. Is this a normal yearning? The other 1/2 wants to warn the new living people of the Demon that lives in the Family room, the dog that has perched itself at the bottom of the stairs -directly in front of (my) bedroom and that little boy that seems so lost. So with all that is happening lately w/my Family, these feelings and thoughts have surfaced surrounding 906. Thanks Martha for Your Time & Energy spent on my questions. May God Bless Your Society with His Mercy & Grace for Protection & Strength for Your journeys into this other realm of reality. Barb, I don’t think it would be weird to stop at the house and tell the owners you used to live there and see if they would let you come inside. You could tell them about the good memories you have from the house and which was your bedroom. You would also be able to see if you have any of the feelings you used to have when you were living in the house. You could ask them, if it feels right, how they like living in the house. Maybe even hint around to see if they have anything weird happening. You could probably tell a lot by their reaction to the question, but I probably wouldn’t warn them because they may not have had any unexplained experiences. No need to make them worry or feel uncomfortable in the home if they have no worries. I have had all sorts of unexplained experiences, seen and heard a lot since I was about five. I can remember telling my parents about something I saw at five that scared me to death only to have them tell me it was just a bad dream. Funny the things you remember from your childhood. this is so cool. you could really be a good source for my writing. let me know if you find anything interesting and i would love to go along if your ever in the houston area. let me know. btw how is your writing coming along? Book is coming along. The MO and IL trip was just what I needed to get me started. You have my number if you find anything and yes, it could be an inspiration for your future books. Thanks for the look up. Our group investigates all over the place, but tried to focus on investigations around the lake. Currently we don’t have visitors on our normal investigations. Be sure to follow us here and on Twitter because we may put together a public investigation sometime this summer. It may even become an annual event. Do you know of any areas in Sulphur Springs? I have never physically went to any one place to investigate, however, rummaging on the net I have found these two places: Hwy 11 Rail Road Ghost- Sulphur Springs, TX and Heritage Park and Museum- Sulphur Springs, TX. I know where the Heritage Museum is located, but have no idea what the claims are. And know where Hwy 11 is, but don’t know the exact location where there is supposedly a ghost…I’m afraid I’m not very helpful past that, but it sounds very exciting nonetheless…Please keep me posted! Thanks! My name is Jerri and I got this link from Caryn Mahoney, we went to high school together and have reconnected on facebook. I was telling her of my interest in paranormal phenomena and she told me that she had an old friend that was interested in the same thing and she gave me a link to this site. I was just wanting to see if you ever happen to be investigating a place around Sulphur Springs or anywhere in East Texas if you would let me come along. I have looked around on the internet for paranormal societies in my area and with all the information and lack of information, it is rather confusing. I am very interested in learning more about paranormal investigating.